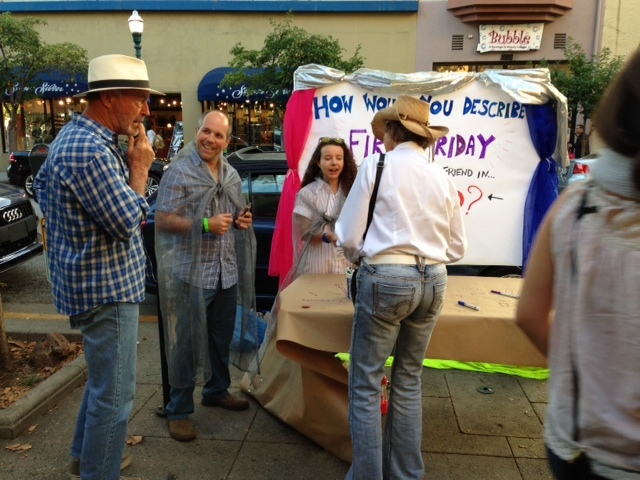 First Friday fuels a positive perception of downtown Santa Cruz. 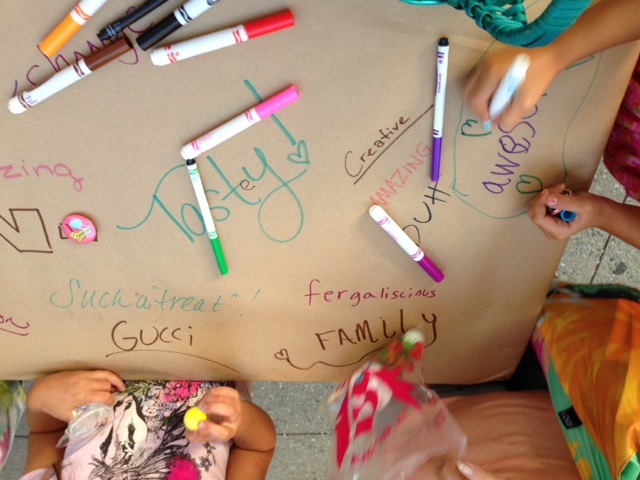 We measured the level of ambassadorship of downtown Santa Cruz inspired by First Friday. 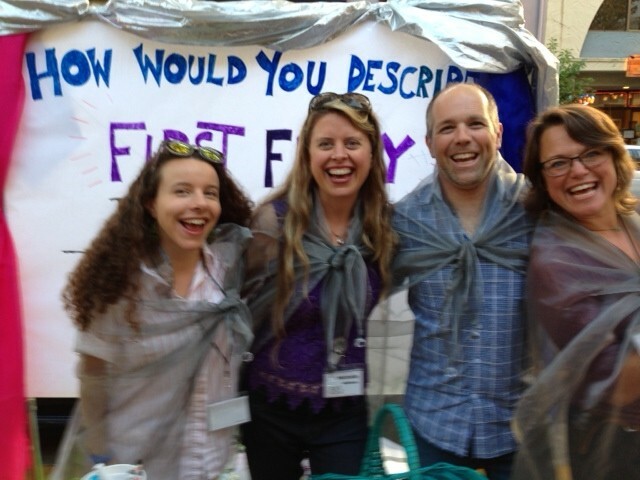 We measured ambassadorship through three methods: a five-question in-person survey; asking people to write down one word that describes First Friday; and by offering everyone we spoke to an "I Love Downtown Santa Cruz" pin. We counted both the number of pins taken and how many people immediately put the pin on. In two hours, we had 230 discrete participants in the word cloud; conducted 33 surveys, and gave out 143 "I Love Downtown Santa Cruz" buttons. - respondents listed the "arts experience" as the highest-ranked reason for attendance, over "hang with friends" and "promote downtown"
- 97% talk to others about FF, 84% invite others. 68% act as an ambassador by either sharing insider knowledge or acting as a tour guide. - 67% of respondents consider FF as a "must-do". 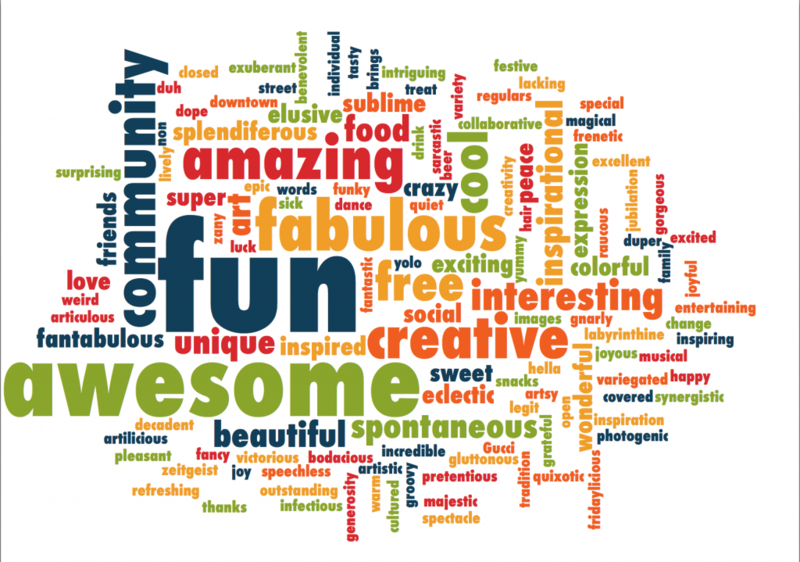 The three most common words from our "one-word"exercise are "fun", "community", and "awesome". 143 people took pins, and 55 put them on right away, about 33%. We believe our data proves our hypothesis. Although our "word cloud" top words definitely reflect a love and appreciation of First Friday, we realize that this may not reflect feelings and ambassadorship of downtown in general. However, the survey data demonstrates a strong level of ambassadorship. And the the fact that so many people took "I Love Downtown Santa Cruz" pins, and that a third of them put them on right away, we believe reflects a strong level of ownership and love of downtown Santa Cruz. Even people who didn't know what FF was were happy to take pins. We were surprised by how many people didn't know what FF was, or who said that they couldn't find participating businesses. Some reported that it used to be far more robust. We were also surprised that several respondents reported feeling a personal obligation to not just share FF on social media but to actually promote it, which showed a strong sense of ambassadorship. "I blow it up of Facebook", said one respondent. We also see in retrospect that our survey didn't really distinguish ambassadors from non-ambassadors, and that it's likely that our respondents were essentially self-selected ambassadors. Finally, we were expecting respondents to say that he social aspect of FF was the most important aspect, and we were surprised to find that the artistic element was the most compelling reason for attendance.